This montage features activity in the turbulent region of Jupiter's Great Red Spot (GRS). Four sets of images of the GRS were taken through various filters of the Galileo imaging system over an 11.5 hour period on 26 June, 1996 Universal Time. The sequence was designed to reveal cloud motions. The top and bottom frames on the left are of the same area, northeast of the GRS, viewed through the methane (732 nm) filter but about 70 minutes apart. 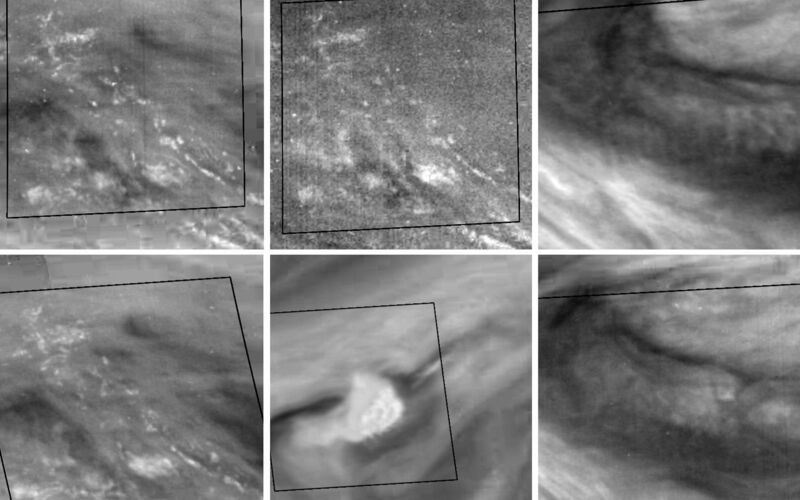 The top left and top middle frames are of the same area and at the same time, but the top middle frame is taken at a wavelength (886 nm) where methane absorbs more strongly. (Only high clouds can reflect sunlight in this wavelength.) Brightness differences are caused by the different depths of features in the two images. 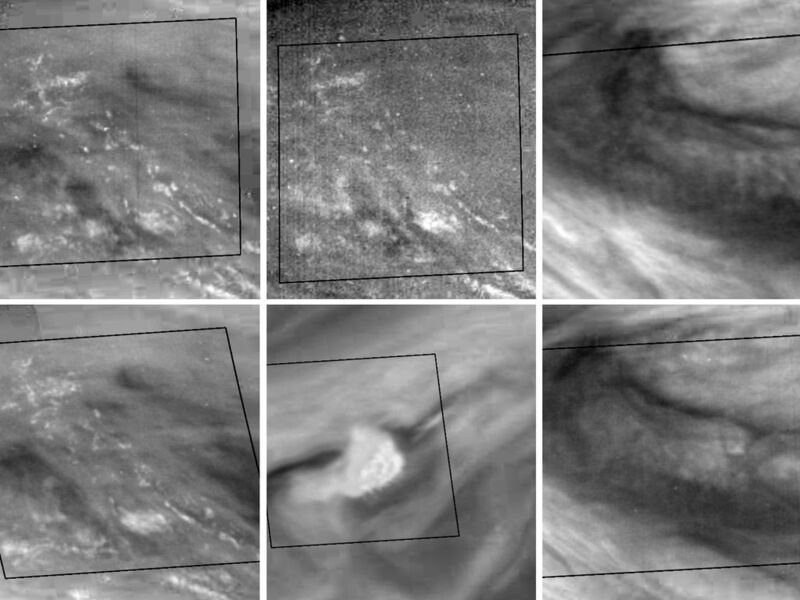 The bottom middle frame shows reflected light at a wavelength (757 nm) where there are essentially no absorbers in the Jovian atmosphere. The white spot is to the northwest of the GRS; its appearance at different wavelengths suggests that the brightest elements are 30 km higher than the surrounding clouds. The top and bottom frames on the right, taken nine hours apart and in the violet (415 nm) filter, show the time evolution of an atmospheric wave northeast of the GRS. Visible crests in the top right frame are much less apparent 9 hours later in the bottom right frame. The misalignment of the north-south wave crests with the observed northwestward local wind may indicate a shift in wind direction (wind shear) with height. The areas within the dark lines are "truth windows" or sections of the images which were transmitted to Earth using less data compression. Each of the six squares covers 4.8 degrees of latitude and longitude (about 6000 square kilometers). North is at the top of each frame.